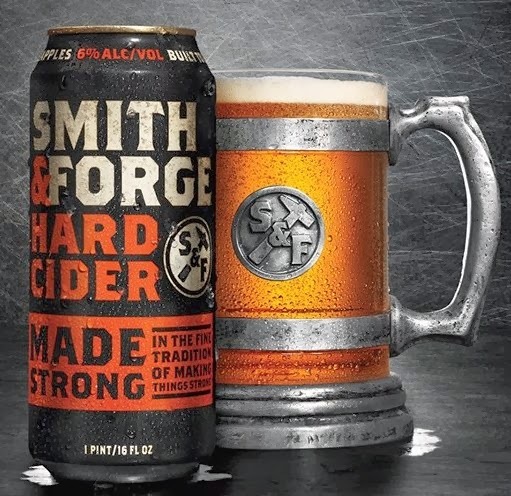 Launching nationally this month from MillerCoors is Smith & Forge, a "just-sweet-enough" hard cider geared toward a male audience. Amber in color, Smith & Forge has 6% alcohol by volume (ABV) and is certified gluten free by the Gluten-Free Certification Organization. The Smith & Forge packaging features a black, bold orange, and antique white design and a distinctive blacksmith’s hammer icon that's designed to appeal to male beer drinkers. Smith & Forge is being sold in 16-ounce single-serve and four-pack cans as well as 12-pack 12-ounce cans. Next month, Anheuser-Busch will debut a hard cider called Johnny Appleseed, named for the legendary nurseryman who planted apple trees throughout the Midwest around the turn of the 19th century. Described as "refreshingly sweet and intense," Johnny Appleseed is recommended to be served over ice. With a 5.5% ABV, Johnny Appleseed will be available in six- and 12-packs of 12-ounce bottles and in 16- and 25-ounce cans. These new ciders aren't the companies' first forays into the hard cider segment. MillerCoors owns Crispin cider, while Anheuser-Busch has two ciders as part of brand extensions: Michelob Ultra Light Cider and Stella Artois Cidre.